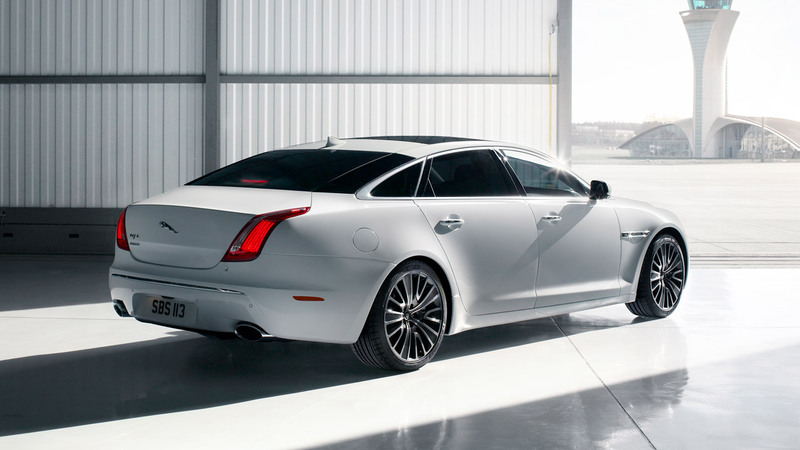 The flagship Jaguar XJ ushered in a new interpretation of the company's established reputation for dramatic design and - with its lightweight aluminium architecture - responsible performance. Now, the XJ Ultimate focuses on two further Jaguar hallmarks: innovation and luxury, extending the model's emotive appeal. Based exclusively on the long-wheelbase XJ, the interior changes applied to the Ultimate focus on the rear accommodation, extending the car's limousine remit to provide a fully-appointed luxury business class experience for the most discerning of global customers. The XJ Ultimate offers the appointments of a private jet in a package to suit a wide range of requirements. Switching the focus from business to pleasure is the bespoke champagne chiller mounted between the two rear seats. This cools the bottle to what experts agree is the perfect temperature before 'presenting' it forwards when the chiller is opened. Two specially commissioned champagne flutes reside in a purpose made cabinet beneath the centre table. A full rear seat package with twin headrest screens and wireless headphones completes the experience in combination with a new 20-speaker surround sound in-car entertainment system developed by British audio expertsMeridian. To underline its purpose in ensuring that passengers remain cosseted at all times, the XJ Ultimate features revisions to the suspension to optimise rear ride comfort, with no compromise to the car's breadth of dynamic ability. The exterior detailing of the XJ Ultimate offers discreet clues to the model's figurehead status with sculpted lower air intakes chromed to match the grille, polished stainless steel oval exhaust pipe finishers, unique dual-surfaced alloy wheels and subtle 'Ultimate' badging. The XJ Ultimate is available with Jaguar's existing 5.0-litre V8 supercharged petrol engine, its powerful and efficient 3.0-litre V6 turbocharged diesel, and a new 3.0-litre V6 supercharged petrol unit, all driving the rear wheels via an eight-speed transmission. The Jaguar XJ introduced a mouldbreaking coupé design ethos to its class, taking Jaguar's established principle of long, unbroken feature lines and applying them to a decidedly 21st century form. Dramatically different from its competitors, the all-aluminium XJ captures the essential Jaguar design elements of elegance, muscularity, sleekness and strength. The detail changes applied to the XJ Ultimate serve to subtly enhance the inherent rightness of the car's design, making it clear that this is the luxurious flagship of the range. The lower front air intakes are reshaped and chrome finished, matching the powerful Jaguar grille, while LED daytime-running lights underline the assertively shaped headlamps. The 20-inch Maroa forged alloy wheels are unique to this model and feature a dual-tone colour scheme. A dark grey, technical finish is applied to the inner surfaces of the spokes which contrasts with the bright, polished surfacing on the outer edges, combining to create an appearance that is both glamorous and purposeful. Anyone following an XJ Ultimate will be in no doubt that the model is a cut above, as it is distinguished by new oval tailpipe finishers in polished stainless steel that echo the front air intakes and a discreet metal 'Ultimate' badge underneath the 'XJ' nameplate. The 'Ultimate' badging is repeated in the power vents set into the front fenders. The first 20 Ultimate models made will be painted in Celestial Black, but customers can also order their car in Polaris White - and any colour in between. In addition to an exclusive extended palette of paint colours, including a new 'chromaflare' range, XJ Ultimate customers can order their car colour-matched to any shade of their choosing on provision of a suitable sample for a true bespoke experience. Jaguar has always prided itself on creating unique cabin environments and the interior architecture of the XJ is like no other, combining graceful and unexpected forms with quality materials that reward the senses with their tactility, visual splendour and luxury. Now, the Ultimate's position as the XJ range's luxury flagship is apparent from the moment the door is opened. A unique wood veneer, crafted using straight ebony, has been formed into a Herringbone pattern with mirror image upper and lower halves separated by a strip of piano black veneer. The Herringbone pattern forms fillets in the doors and at the front of the car runs around the base of the windscreen to create a dramatic feature that mimics the form of classic wooden-hulled power boats. The clock mounted in the dashboard is also unique to the model with a brushed aluminium face, embossed lozenge detail and 'spun' bright finish. The XJ Ultimate is offered in three interior colourways for the sumptuous leather that covers virtually every surface and is also used for the headlining; Jet on Jet, or Ivory seats and lower surfaces with either Mineral orBordeauxuppers. Further personalisation is offered through customers being able to specify the headrests embroidered with a pattern of their choice. The 'Ultimate' intaglio which sits in the centre of the sweep of Herringbone veneer under the windscreen can also be changed to read whatever the owner wishes. The XJ Ultimate brings a particular focus to the rear seat passengers to create an ambience that carefully balances the requirements of the modern, on-the-move businessperson with certain surprise-and-delight features that underline the XJ's 'work hard, play hard' personality and reward the discerning owner who appreciates the sense of fun with which Jaguar imbues all its products. In the Ultimate the XJ's standard rear bench has been replaced by two unique and individual seats designed specifically for this model. Elegant, cosseting and ergonomically optimised, the tailored seats are covered in semi-aniline leather which offers a more luxurious and tactile finish and allows the hide to retain its essential qualities of look and feel, complemented by the hand-finished stitching. The seats feature winged headrests, powered recline and four-way lumbar adjustment functions to allow passengers to achieve the seating position perfect for them. The comfort levels offered by the seats are enhanced through the inclusion of on-demand massage, heating and cooling functions. The occupant positioned behind the front passenger seat is also provided with a stow-away button that automatically powers the empty chair forwards to increase still further the XJ's generous legroom. The front seats follow the same unique design as the rears and offer identical functions with an additional range of electric movement allowing 20 by 20 adjustment. The seats are divided by a centre console running along the length of the car. Fully trimmed in soft-grain leather, piano black veneer and chrome, the console houses a number of features exclusive to the XJ Ultimate. At the touch of a button a table machined from a solid piece of aluminium with a gloss black and chrome finish rises up to then be pivoted into position in front of whichever passenger requires its use. Raising the table reveals the first of the XJ Ultimate's surprise and delight features, a pair of champagne flutes in a bespoke recess flock-lined in either Mauveine or Jet and lit by phosphor blue ambient lighting. Within the centre console are 'fluteholders', designed specifically for these glasses and machined from solid aluminium. The flutes are, of course, there for a reason: discreetly integrated between the rear seat backs, covered in soft-grain leather and marked by a chrome Jaguar leaper is a hidden champagne chiller. Lined in the same flock as the champagne flute recess to give the impression of a bespoke suit lining, it holds one standard sized champagne bottle which, when the cabinet door is opened, is effortlessly presented forwards to the passengers. The champagne is kept perfectly chilled at the optimum temperature range of 7°C-10°C. Rear-seat passengers are also provided with a range of entertainment options to enjoy while sipping their champagne. The XJ Ultimate is fitted as standard with Jaguar's Rear Seat Entertainment package which comprises two eight-inch high-resolution screens mounted on the back of the front seat headrests. These can display inputs from a number of sources; the DVD player, digital TV tuner or an external media player that can be synced through the Rear Media Interface, which provides USB and RCA connections. Sound can be provided through the wireless headphones, allowing each passenger to watch separate entertainment sources. 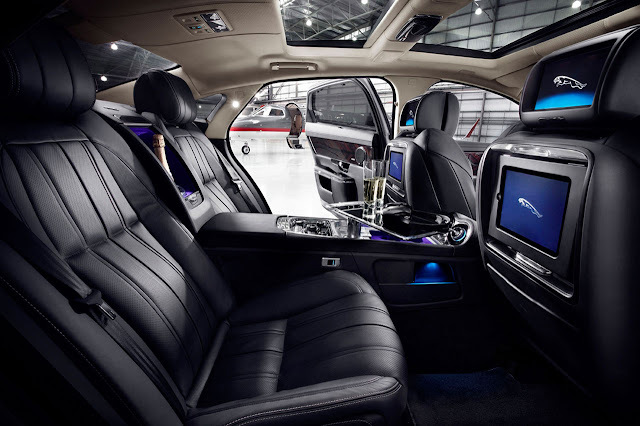 The rear seat environment, including the entertainment, is managed by a wireless controller housed in the centre console and which also allows passengers to alter their individual climate zones and seat heating and cooling functions. 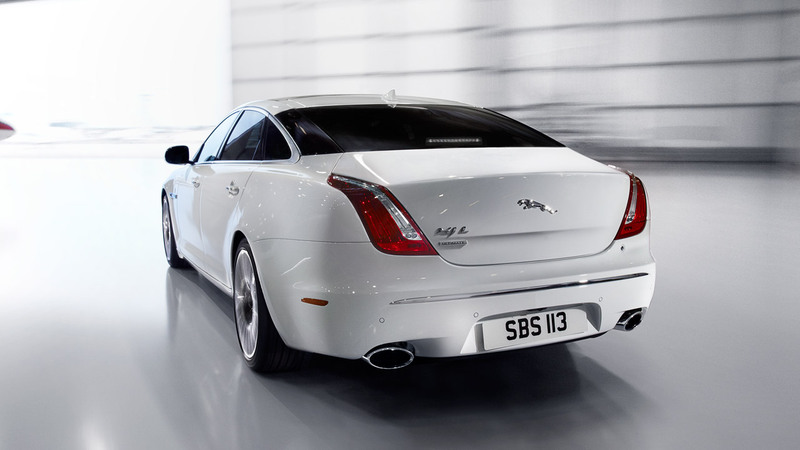 The XJ Ultimate is also fitted as standard with the latest generation of in-car audio systems. Specifically developed for the XJ by British ultra-premium audio expertsMeridian, marking a new partnership for Jaguar, the Meridian Surround Sound System fitted to the XJ Ultimate uses the latest technological developments to deliver music reproduction that is second to none. Unlike other manufacturers,Meridiandesigns and manufactures audio systems that combine innovative technology with the most natural of approaches: comparing their musical reproduction to the sound of the original musical performance. The 15-channel amplifier, 20-loudspeaker system featuresMeridian's unique digital sound processing technology that allows every person travelling in the XJ Ultimate to enjoy a musical experience that places them in the centre of the sound field.Meridianachieves this through its Trifield technology which creates an all-enveloping sound field that makes each listener feel that the music is exclusively focused on him or her. Meridian technology achieves a level of natural detail, realism and performance usually associated with speakers eight times the physical volume. Meridian Cabin Correction and Dynamic Volume Control precisely and effortlessly minimise resonances and monitor extraneous noise levels to allow the audio to be unobtrusively maintained at a constant volume in order for it to be perfectly heard whatever the circumstances. In addition to the entertainment on offer, the XJ Ultimate also provides a pair of third-generation iPads® with wireless keyboards. The iPads® are housed within specially designed leather-trimmed docks in the rear of the front seats and hidden behind roller doors, also finished in tailored leather. The iPads® are automatically kept charged whenever the ignition is on and also included in the cabinets are wireless keyboards to allow the tablets to be used without being removed from their docks if required. To underline its purpose in ensuring that passengers remain cosseted at all times, the XJ Ultimate features revisions to the air-sprung rear suspension for optimised ride compliance. While this provides a truly relaxing experience for rear seat passengers, the XJ Ultimate loses none of the model's core dynamic abilities and so is as rewarding to drive as it is to be driven in. 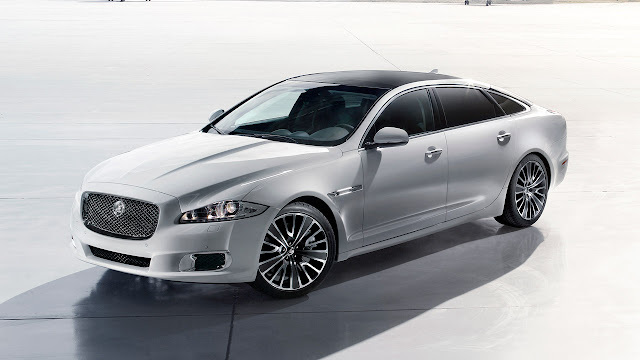 The XJ's lightweight aluminium construction means a weight saving over its rivals of as much as 150kg. This of course offers great advantages in terms of agility, acceleration, braking and driver feedback and involvement. The aluminium architecture also provides benefits in terms of emissions and fuel consumption, allowing the XJ to provide an astonishing balance of performance and frugality from its range of highly efficient, refined and muscular engines. The XJ Ultimate will be offered with Jaguar's existing and acclaimed 5.0-litre V8 petrol engine in supercharged form, and the equally highly regarded 3.0-litre V6 turbocharged diesel. With 510PS and 625Nm of torque, the supercharged V8 provides astonishingly vivid performance, the diesel V6 offering uncannily smooth and potent progress while returning fuel consumption figures of 40.1mpg (EU) on the combined cycle. The XJ Ultimate will also be offered with a new 3.0-litre V6 supercharged petrol engine being introduced to the range for the 2013 model year. This engine, which in the XJ Ultimate will produce 340PS and 450Nm, draws on the award-winning technology inherent to Jaguar's V8 and offers similar performance to the naturally-aspirated version of that engine (which is not available in the XJ Ultimate), but with the emissions and fuel economy advantages of a V6. The 3.0-litre V6 S/C will be offered in tandem with Jaguar's Intelligent Stop-Start system and, in common with all powertrain options, will drive the rear wheels through an eight-speed automatic transmission.